Oh Baby Baby! Traveling with Baby! On June 14th, 2010 Tim and I had our favorite blessing come into our lives. Jack Hatcher (more often called Jack Jack) is literally a hand-full of joy and we love him more than words can say. When we decided to have children, Tim and I knew that we were not the type of people to let life stop and solely revolve around our children once they were born. We believe that our children are a much wanted and welcomed addition to our lives. Yes, our daily lives would inevitably change with their presence, but we would still keep doing and experiencing the things that we love, with tiny Elrods in tow. Vacationing in Walt Disney World was one of those things. 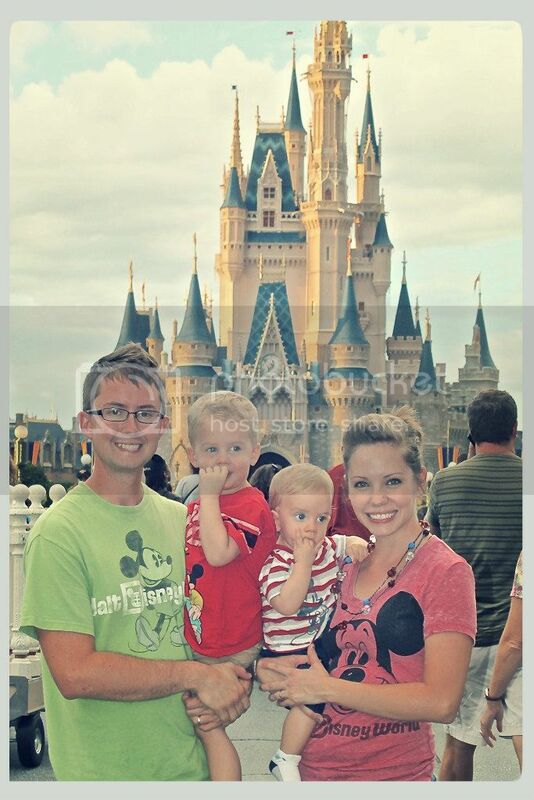 Luckily for us, however, Disney makes vacationing with babies as easy as A. B. C. and 1-2-3! A. B. C. Three reasons why vacationing to Walt Disney World is a good idea! 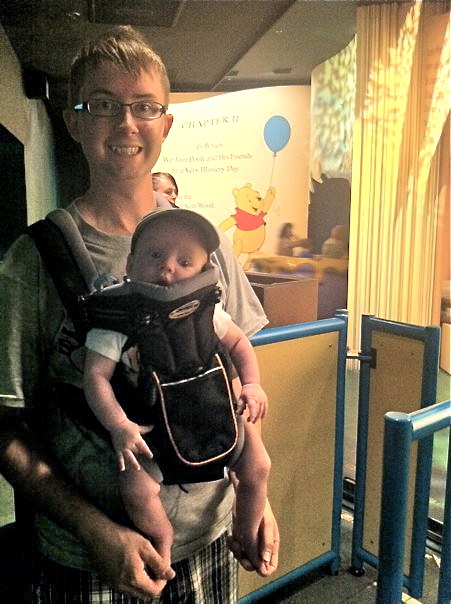 Jack riding The Many Adventures of Winnie the Pooh at three-months-old. One of the best reasons vacationing to Disney with a baby is great is because there is plenty to do and ride for parents and even for expectant mothers! Many rides, especially in Magic Kingdom, are safe for tiny passengers. Just take a look at your park guidemap for attractions that would be unsafe for small children or pregnant mothers. There are also signs outside of each attraction queue that will let you know any risks involved. Tim and I found it easiest to simply strap Jack inside of that backpack carrier and bring him along for the ride! He seemed to enjoy it and I think vacationing with him at such a young age helped him to become so much more aware and observant. There was so much visual stimulation! Also, at the attractions that are not suggested for young children, Disney has something they call Rider Swap. For a Rider Swap, one adult can wait in line for an attraction while the other waits with the child. After they ride, the child-tending adult can immediately swap places with the other and get on the attraction without waiting. How great is that? It’s nice that Disney understands and respects your time, so they don’t make you wait in line twice. For more information about Rider Swap, talk to a Cast Member at the attraction you would like to ride and they will give you directions on what to do and where to go. Eating lunch in the Baby Care Center in EPCOT. 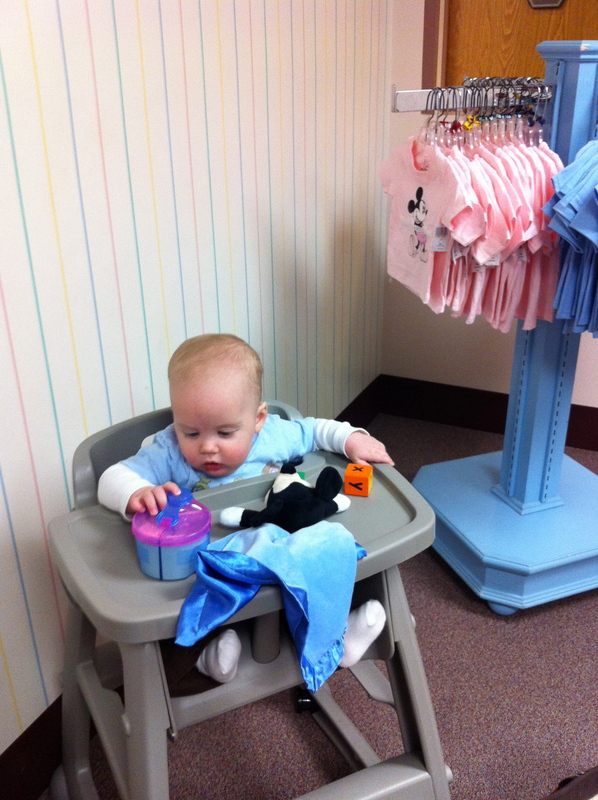 I know I have mentioned them many times before, but I am a huge advocate and lover of Disney’s Baby Care Centers! Located in each park, Baby Care Centers have anything and everything you could need to take perfect care of your baby, no matter their age. Complete with private nursing mother areas, highchair feeding areas, microwaves, sanitary changing tables, and small stores where you can purchase any items you may have forgotten to bring, from diapers and wipes, to formula or sunscreen. Of course they also have cute tiny t-shirts, hats, and toys to tempt your pocketbook. Baby Care Centers also have TV’s featuring family friendly Disney cartoons and small activities like books and coloring pages for those slightly older kids that may not enjoy having to take time out of their day for a sibling’s diaper change or feeding. Also, I would just like to let you know that although I’m not obsessive-compulsive about sanitary cleanliness, it definitely ranks high in my child-rearing concerns. Tim and I are admittedly the parents that sanitize the tables we sit at in restaurants and scour toys that are thrown on the floor. To our happy observances, however, the Baby Care Centers are kept very clean. We’ve noticed that they are usually monitored by at least two Cast Members who wipe down and sanitize highchairs and eating surfaces often, and clean changing tables and change their paper covers after each use. I even witnessed a mother asking a Cast Member to hold her child while she washed her hands and used the restroom herself. The Cast Member did so with joy! Check your park guidemaps for the location of each Baby Care Center and definitely use them to your advantage. They are there for YOU! 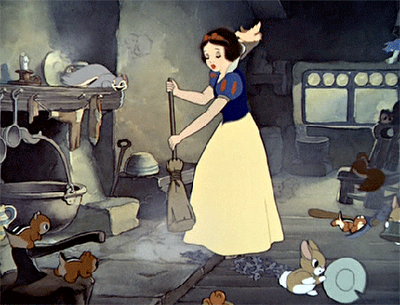 I’m sure it’s Snow White and all of her woodland friends that keep Disney so clean. Whistle while you work! And while we are on the subject, I want to squash the excessive bed bug rumors that have been circulating. Although bed bugs have been found at Walt Disney World a time or two, it is not the norm. Bed bugs are an inevitable problem for any resort, regardless of the quality of the accommodations. The only way you can prevent bed bugs from entering your establishment is to do a strip search of all of your clientele, becuase it is resort guests that bring them in. Disney does a great job cleaning their beds and linens, but because they are such a big and prominent name, they will of course get more attention for the problems that every hotel battles. Just know, it is absolutely up to you if you feel more comfortable searching your bed before sleeping in it, or bringing your own linens from home to sleep on. Also, we have never had a complaint that Disney did not go above and beyond to fix. We have had offers for new or upgraded rooms for something as small as a shower drain not draining properly. (Which, by the way, turned out to be my Dad not knowing that you had to twist the stopper it to get it to stay open. Ha!) All that to say, Disney is certainly a clean and safe place to stay. 1-2-3. My top three tips when taking a baby to Walt Disney World! 1.The younger they are, the more you should splurge. Our kitchen and dining at Bay Lake Tower. Not on souvenirs, silly, although it’s awful tempting with the cutest baby clothes and toys all around you, but on your accommodations! 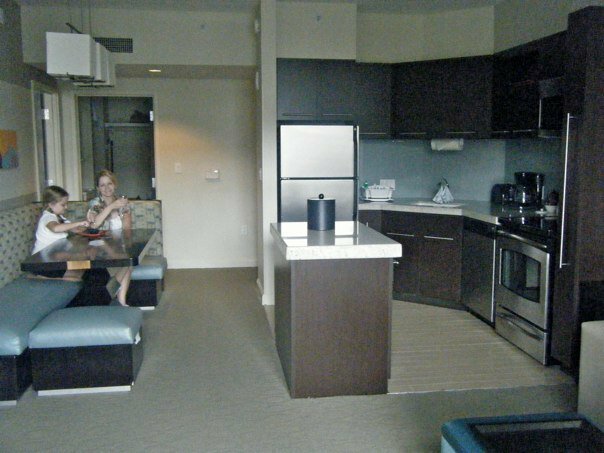 When we took Jack last September, we chose to stay in a one bedroom condo at the Contemporary’s Bay Lake Tower. We knew that we would want to spend a majority of our park-visiting time at Magic Kingdom, so how convenient was it that it is a breezy five-minute walk from Bay Lake Tower to Magic Kingdom?! We also knew how nice it would be to have a kitchen with a three-month-old, for heating and washing bottles, and a washer and drier for all that baby laundry, so we wouldn’t have to pack a million and one outfits. Each of the Disney resorts has options for various accommodations, including the Value Resorts. You can get a suite at the Value Resorts that includes a kitchenette! Even the camp grounds have cozy log cabins that have full kitchens. I suggest staying near your favorite park, or the park that you know you will spend the most time visiting, that way middle of the day trips back to the room for naps or what-have-you can be done easily and quickly. Here is a list of the parks and their nearest resorts. 2. Bring a helping hand. Grandaddy hanging out with Jack by the pool while I relaxed in the room. Like I’ve said before, we have taken Jack to Disney three times, and two of those times we have had family and friends with us to help us out. Last September we had my parents with us and this March, for our Spring Training trip, we had my best friend Julie and her husband Chris with us. It makes it a lot easier when you have the extra hands getting out a diaper bag in the parks, or taking shifts toting the increasingly heavy traveler. 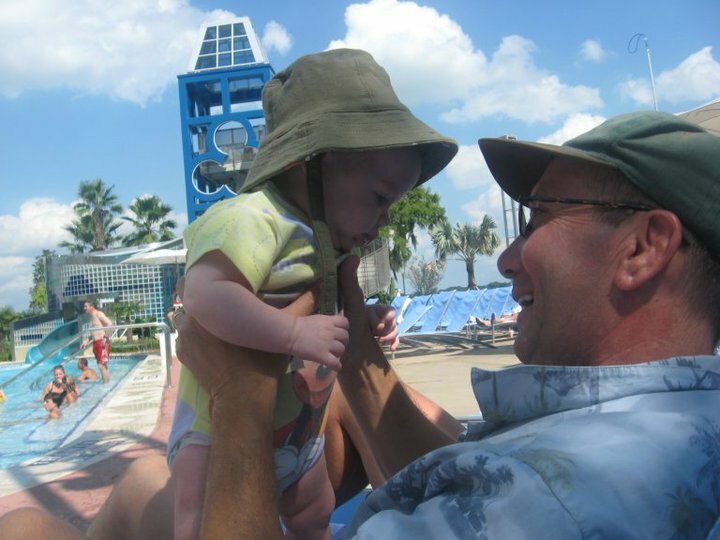 It took a lot of stress off of us, having that extra support, and having the grandparents there, who were craving some one-on-one time with their first ever grandchild, Tim and I even got a chance to get away, just the two of us! How nice! But know that if having the extra help on hand is just not in the cards for you, Disney is still totally doable. When Tim and I went this Christmas by ourselves with Jack, we still had a wonderful time! It was just not as relaxing or easy as it could have been. 3. Stay on your schedule and keep stress at a minimum. 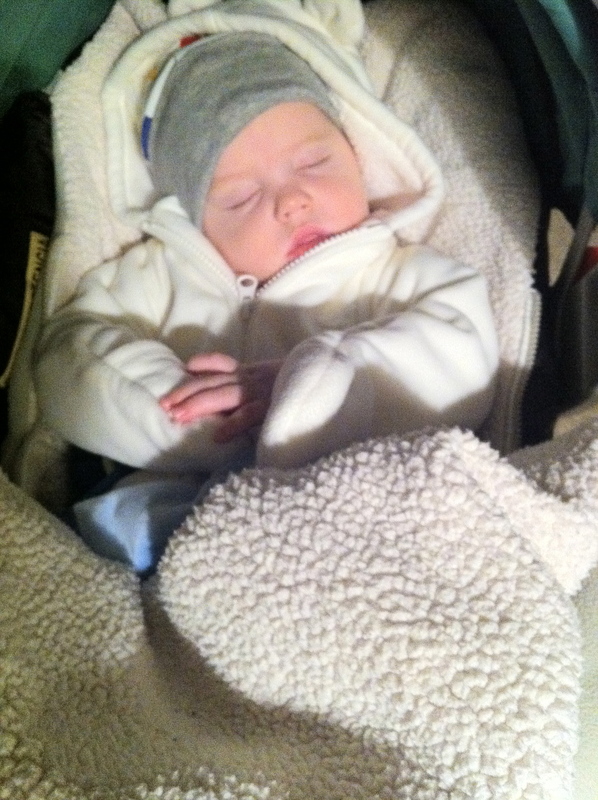 Going “night-night” in the stroller, while Mom and Dad stay up for Mickey’s Very Merry Christmas Party. Many feel the pressure to “go-go-go” when visiting Disney, and while this can be fun and make you feel that you are getting your money’s worth out of your trip, I would like to give you permission to take a breath [big breath in…and let it out…] and keep to what works best for you and your baby. I am a Schedule-Mama. Jack eats at a certain time, sleeps at a certain time, and plays at a certain time. We fit Disney into his, and my, schedule just fine. It did take a little bit of pre-planning, but we made sure that Jack got the sleep he needed at night, while mapping out which attractions or shows we would like to do based on the time of day that worked best for us in time and location. I would even take Jack back to the hotel room in the middle of the day for a nap. It was nice that he got the rest he needed to stay a happy baby, and honestly, being a new mother, the rest was nice for me too! My family and husband would either stay in the park and I would meet up with them a few hours later, or one of them would come back with me. After our trip last September, Tim and I decided that it was one of our favorite Disney trips ever, because we actually took the time to enjoy our resort and slow down and rest on our vacation. It was so refreshing. Also, listen to your instincts and your baby, and don’t stress out. If you have front row seats for a parade or fireworks show, but your baby doesn’t like how loud it is, cuddle them and take a few steps back. You may not have the best view, but don’t worry, within a few short years, they will be begging to be right next to the action. I also can’t stand to see mothers stressing out about a crying baby. Although, I know first-hand how hard it is to hear your baby cry, I have also had to learn not to worry about the people around me. In the beginning, I was finding that I would coo or coddle Jack just to quiet him in public, even if what I knew was best was to just let him whine a few minutes and fall asleep in the stroller. I quickly learned that I need to do what is best for Jack, not what is convenient for that guy in his mid-20’s that has never had a kid and looks annoyed by mine. Babies cry. That’s how they communicate, and in some cases, how they wind down. Don’t stress out about it, especially when you are supposed to be vacationing! At the end of the day, I just want my take-home to be that if you are really wanting to take a Walt Disney World vacation, don’t let the fact that you have small children or even babies scare you away from going. When we were down there with Jack at three months, we had families tell us that they brought their kids down at just as young an age. We even had one mother admit that they brought one of their children at three weeks old! Wow…props to her, because I don’t think I was physically ready for a Disney vacation after three weeks, but hey, more power to ya! Her family must have been even more die-hard-Disney than mine! I hope that I offer you encouragement, and always know that if you have any specific questions, I am here to help! I want to go back to Bay Lake Tower! Us toooo! Maybe this year? Fingers crossed!